Auckland’s city centre has rapidly been changing for the better but perhaps nothing screams Auckland of old as much as using prime waterfront space for a carpark. That carpark being the Eastern Viaduct Carpark, the next to the Maritime Museum and that links the city to Te Wero Island and North Wharf. The good news is that from March next year, following the Volvo Ocean Race, the parking will finally be removed for good and all of the space handed over to people. Panuku Development Auckland are now looking for feedback on what to use the space for. To do that they’re holding an event at the carpark this weekend. The public’s ideas on how Eastern Viaduct could be shaped when it becomes free of public car parks are being welcomed by Auckland Council’s regeneration agency, Panuku Development Auckland. Public parking next to the Maritime Museum will be removed for good following the completion of the Volvo Ocean Race on 18 March 2018. This is being done to prioritise the space for pedestrians and cyclists, and improve the connection between the waterfront corridor and Wynyard Quarter. Panuku is inviting people to visit the area from 30 September to 1 October between 10am and 4.30pm to play the Place Game, a Project for Public Spaces tool that allows participants to share their thoughts on a space. The feedback will help inform the design brief for the space. To help people imagine Eastern Viaduct free of public car parks, The Place Game will be available while parking is temporarily off limits to make way for The Auckland On Water Boat Show, which runs from 28 September to 1 October. The project is one of a number proposed as part of the refreshed city centre and waterfront plan, which Auckland councillors agreed to advance at a planning committee held last week (Tuesday, 5 September). Once public parking is closed, some vehicle movements on Eastern Viaduct will continue. 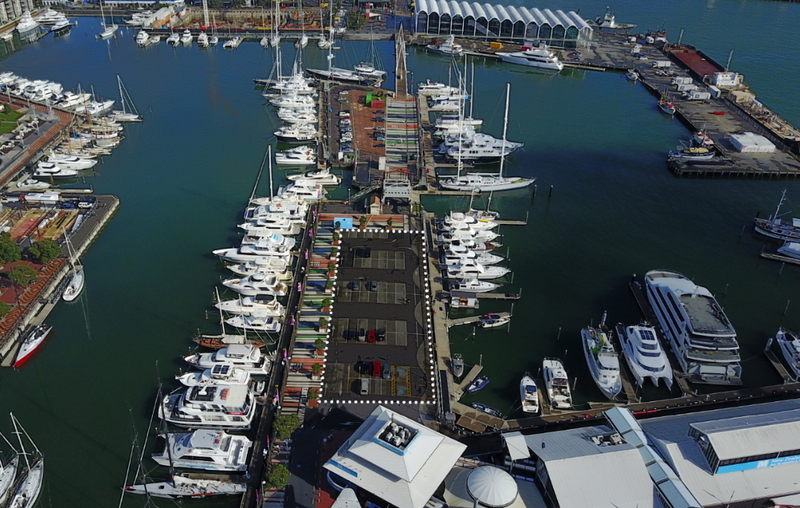 Parking for berth holders will remain unchanged and service vehicles will be permitted access to deliver to businesses and restaurants on Viaduct Harbour. Rod Marler, Director Design & Place at Panuku, says the removal of public car parks will improve connectivity, legibility, and visibility across the waterfront and encourage more people to explore the area, which sees about 1.9 million people pass through it each year. He says: “This is a great opportunity to design a quality public realm that prioritises pedestrians and cyclists, improves safety and enhances the quality of the visitor experience. The nearest public parking to Eastern Viaduct is in Downtown car park, which has more than 1900 spaces including 19 mobility car parks. More mobility car parks are available on Princes Wharf and in Wynyard Quarter. For more information on The Place Game, visit: http://www.wynyard-quarter.co.nz/news/shape-aucklands-waterfront. Nothing complex required, stick in some plants, maybe some sculpture ? I think it would be a good space for market stalls, pop-up shop type things and seating to watch the yachts come and go. And through the middle a casual diagonal cycleway. Might go down this weekend to check it out. When I saw the headline I was thrilled because I thought it was a reference to the Godawful Downtown Carpark which should be next in line for demolition. The Waterfront Carpark should have lots of seats and places for people to stop and read under nice shade sails to enjoy the view, have a drink, and watch the world go by. Hey mate, the downtown carpark building that’s run by AT does a good job of allowing me to find parking in the downtown Auckland. I bus into/from the city but it’s nice to know that if I need to drive in I have somewhere to park. I agree with you that the viaduct carpark should be gone. Stop being anti-car-parking. It’s a poor use of a very valuable site, with the prices they charge I’d be surprised if they are getting a decent return on investment currently. Hi jezza, you’re right about the site being valuable. At the end of the day AT is subsided by ratepayers (us) who contribute to things like running these parking buildings. At the current moment in time people who need to drive into downtown need somewhere to park. The public transport option just isn’t there for some people. We need the parking building until the city goes through a revolution. And anyway, AT are very good at making money, for example by ticketing people who are parked 1 minute over the time limit, or by taking photos of people who use a little bit of the bus lane, or by making it look like cars can drive through Grafton Bridge during the day, etc. At the end of the day all that revenue has to go somewhere – and I’m certain it’s not going to funding my local bus service, because that bus is always late and the bus always smell and is as infrequent as an 70 year old incontinent man. Like you I usually use PT but occasionally bring my car in when it is more convenient for me. However, storage of a private possession (car) in the CBD sounds more like a want rather than a need to me, I can’t really see any reason for it to be effectively subsidised. If your local bus service is as you describe it is probably attracting quite a high subsidy ironically. It’s the more frequent services that are more popular that generally require less subsidisation. I think AT should subsidise buses further, however they are a bit restricted by government policy at the moment. Sorry but I struggle to see how it looks like you can drive down Grafton Bridge during the day. Massive electronic sign that overhangs the lanes with a massive cross for cars?? Also Bus-lanes are very well marked on where you can begin to enter the lane as it ends, no excuse for being in them. Its a volunteer tax if you get ticketed in one. Agree cars still need to be allowed for, and we shouldn’t go demolishing all carparking buildings, this carpark is also very well used. It does need some retrofitting however to make it not look not so much like a boring car-parking building, and possibly turning at least some of the spaces into a bit more multi use. That’s true but, for now, carpark buildings enable the removal of more on street parking of level parking lots such as is mentioned in the post. Pricing on Council owned carparks is still too cheap IMO. +1, I struggle to believe that they are under 90% occupancy during the day…. Price needs to go up until they actually start emptying out so we can start to get casual parking in there rather than all day/. Yes I don’t think we need to worry & this building will eventually go. We first need new bus networks all up and running, CRL & LRT & more cycle facilities in place. The downtown parking building is perfectly located. Particularly for weekends. I am sure you would rather people park there than on the street. As for it being subsidised given how full it is I would have thought it would make a profit. Just not the excessive profits of the likes of Wilson. What does excessive profit mean? Wilson is a private company and providing parking in the CBD is not really a public good. Wilson’s make a profit only because the owners of the land make a huge loss by renting the land to Wilsons at far below the holding cost. AT lose millions a year by operating parking buildings. The building is the perfect location for the much-needed bus terminal. I understand that they’ve looked at the economics of this and it doesn’t stack up. So some decisions are based on economics (which prevent good bus terminals) and others are based on, what, providing a public good of _carparking_? ?, and don’t need to be justified by economic analysis? That’d be about right. Heidi, I believed they looked at converting the lower floors of the carpark to a bus terminal but found it very difficult (low ceiling heights, split levels etc). That’s not to say the economics don’t stack up. They could demolish the carpark building and replace it with a fifty story tower, with a bus station, shops, some parking etc. I imagine that would be a very economic proposition. It is effectively subsidised given the money the city could make off the site if it wasn’t used for parking. You only need to look at Commercial Bay going in next door to see the opportunity cost. As for parking, well we already have more off street parking than the Sydney CBD despite that being four or so times the size. We have more than we need to be honest. The downtown parking building has 1,890 car parks in it. At our vehicle occupancy rates that brings in 2,200 commuters a day. So the whole building is supplying less than three train loads of people a day. By comparison the city rail link will deliver that every five and a half minutes on opening day. Or to put it another way, the amount of people moving capacity the basic CRL *adds* to the rail network across the two hour peak is equivalent to eleven downtown carpark buildings. And that is before we even start talking about the northern busway, ferries, light rail etc. We can afford to repurpose one parking building on prime land in that context! I have no problem with car parks or car park buildings, I just object to AT buildings. Invariably these buildings incur losses or make a poor rate of return and as a rate payer I can’t see that it my function to provide “social parking”. Unfortunately AT seems to think that they have such a function. I quote an AT employee who told me that, “we (AT) have to provide parking for poor people?” Absurd. How do they regulate that only poor people use these parks? I have never been asked for a bank statement at the entrance way. As someone mentioned, let AT divest the downtown car park as a first step and have a structure that will make better use of the sweeping harbour views. And the funds that are freed up could be used for more useful projects such as a sensible entrance way to the K Road CRL station. Or the Skypath. I’m not “anti-car-parking”. What I don’t like is that one of the prime waterfront sites in the CBD is blighted by a large car park that makes getting from Albert/Hobson Street to the waterfront almost impossible. I have parked there over the years as well but you have to admit that it is a pretty poor use of that space. I think it is a good use of the space albiet that the pricing should be set for casual use and not all day parking. Its location means easy quick access from entering the city taking cars off the road. It is the main place that tourists (from Auckland, rest of NZ and overseas) park to visit the viaduct etc. Which brings a lot of money into the city. But (as Nick says above) we have more off-street parking than Sydney does. Given that parking is one of the very things that keeps people driving, is it so very well located? Certainly if you’re going to the viaduct, it’s really nice to arrive by PT. Sure, the other end of the journey might not be so well connected, but on the flip side, plenty of people who are well-served by PT still drive. If there is anywhere in Auckland we can put a stake in the ground and say, “This is a location you can come to by PT only,” it would be here. By that logic why are we building cycle lanes to the city? Surely people should be taking PT instead? Well-spotted. OK, perhaps the message with the stake should be “This area of the cbd is not suitable for private cars.” If I’m travelling, I don’t expect to be able to drive a car into a city’s cbd. Why should any tourist expect to do so in Auckland? A well defined route for movement (this is a key cycle and pedestrian route). A nice place to sit and watch the marina and the harbour! Also, it’s more than time that council removed this car park. Good on them for finally doing it. put a big swinging Pirate Ship – Rainbow End please!!!! sand pit/ ferris wheel, roller coaster, vertical bungie, kelly taltons, piano. . I would be interesting to hear others thoughts. It would be great to see it as a space that draws in more families as the playground does but I guess it is relatively small. I still want to see the area have one of the world great promenades too up through quay street. Great idea. This is one of the biggest benefits of removing parking -> removing traffic. People should be able to walk across this “stub” without waiting for a signal. Figuring out how taxis circulate will be tricky though. Princes Wharf should also be car free (except delivery vehicles). Princes Wharf is such a disappointing part of the waterfront. Way too many cars and no good public space. That would definitely simplify the intersection. Isn’t it in private hands? Also, there are internal carparks in there so even if was a public property you wouldn’t be able to shut it off entirely without being sued to death. I Vote for a play area with limited stalls. There is not many plays areas for Kids for the people who live in the city. Yes, I agree. My 11-year-old says it should have gym equipment. For maximum amenity, they’ll need to think what would be great when it’s windy: kite-flying? A play area with a proper carousel and stalls for games, shopping and food? I’m keen for an obvious pedestrian/cycle route that is a direct link from the bridge to the Viaduct entrance area. Keep a perimeter promenade with rest areas for boat/people watching. Spaces for a rotating series of pop up vendors in containers or carts – coffee, ice cream, lunch food, etc… Plus more trees. CLICK BAIT! I honestly though the title was talking about the awful Cook Wharf Car Park. Got excited for a bit. I was gonna say a Santa Monica Pier sorta amusement park would be good to attack people back to the water. It would be great to have this as a multipurpose recreation area with a designated lane for cyclists and pedestrians at the waterfront edge to allow for easy commuting. I think the CBD really lacks safe and social spaces for young people. Using say 1/3 of this car park space for an inner city skate park would be awesome, and would hopefully draw skating away from Queen street where it’s a nuisance. The rest of the space could be grassed over (not including the commuting lanes) providing a bit of much needed green in the middle of the city. We could put a set of swings in, seating, fruit trees or a community garden. It doesn’t need to be flash, keep it simple and accessible, and people will make it their own. Grass, trees, the odd but of seating. Maybe a childrens playground. Largely it should be open, uncluttered and natural, to contrast all the concrete in that area. And replicate the green theme on the Halsey St extension. It’s a wharf. Made of Concrete. No place for grass to grow, and nor should there be – high traffic area, lots of people walking, salty atmosphere, grass is a really bad idea out there. Needs to be hard-wearing materials, i.e. timber, steel, concrete, etc. Not dirt and grass seed. So what is the purpose of the consultation? Have they already decided what they want to do and they just need to go through a process to do it. Or worse have they actually got no clues about what to do and they are looking for an idea? At the least it’ll be nice to walk through there without looking around for cars. Maybe some seats if people want a break in their travels to Wynard? This seems a common sense idea. There is adequate parking nearby and this particular park is limited to put it nicely. What is surprising is that our beloved council thinks it needs to consult. We pay exorbitant rates so our council can employ experts to design our city. Yet our rudderless ship needs to consult with you and I to decide what to do with public space? As an aside I’m being unfairly locked out of contributing to this forum at the moment. I can appreciate that not everyone agrees with my opinions but to have a robust discussion we need a variety of opinions. I’d appreciate your support in my quest to get back on here unmoderated. So if everyone could end their posts in #freeTRM I’d be extremely appreciative. I’m not an expert but i think you’ll find that consultation is a legal requirement of both the lgaaa and rma, one of which seems likely to b apply in this case. If council hadn’t consulted, then you run risk of appeal. I could be wrong though. Only glanced at the comments about male suicide and wish I’d read them more, as young men feeling purposeless is a concern of mine. Given your other comments, it’s not beyond belief that they were unhelpful. Given your occasional gem of a comment, I’d like you to keep commenting but try to do so respectfully. I take your point Stu but there must be a threshold for when consultation is required. Consultation has it’s place, particularly where residents are affected but this is not one such instance. Here we are talking a car park within walking distance of the downtown parking building in an area where residents are almost totally unaffected. It is sub-optimal and cost inefficient to consult given the circumstances. yeah there probably is a threshold, although such things are always up for legal challenge. In terms of your crusade to be freed, the Blog seems to accommodate widely differing points of view — even betweem contributors! The key thing is that comments accord with the user guidelines. Do yours? The new design needs to work with the new bridge that is to replace Te Wero bridge. https://www.greaterauckland.org.nz/2014/09/08/replacing-the-te-wero-bridge/ Whether the new bridge will carry a LRT line should be looked at as part of the consultations, as it could potentially line up Quay St and Halsey St. Taking that route means that light rail can be kept away from the new cycle lane that is to go along Market/Customs Streets where everything (LRT, cycles, pedestrians, and roads) would have to converge at the cluster that would be Lower Hobson Street. If you want to use Te Wero for LR then you’ll also have to accept it being regularly interrupted to allow boats in and out of the harbour. I think the plan is to build a new bridge joining Pakenham Streets up or joining Customs St with Madden St where they could then designate only shorter boats could berth on the inside of it with the taller ones remaining outside. Do we know how many private carparks will remain? The statements released make it clear that this is only the removal of public carparks. The private carparks will remain on Te Wero Island, so cars will still need access through the area. Auckland’s waterfront is a mess; hopefully this helps tidy it up somewhat. As others have noted it’d be great to see the end of the stub off Quay. As for where taxis go — there seems to be enough on-street parking on market street etc for a decent sized rank. Copy Toronto’s Canada Square and on the other section of wharf, once that becomes possible to develop, copy Toronto’s Sugar Beach Park. Would be happy to submit an entry in a design competition..Maybe Panuku can develop a short brief and let people have a real crack at it in the next few weeks. Seemed to work for the park on Ponsonby Rd. I’m assuming a road and railway track will take up a bit of space as for some reason the plan is to have cars and trains going over a new Te Whero bridge isn’t it? Hopefully that idea has failed to get off the ground. No, the plan was never to have cars or trains. There has been talk of a bus route or tram but I think they’ll stick with foot and cycle only. Yes it is a resource consent requirement that the bridge open on demand for boat traffic and and out of the basin. That’s obviously a big issue for a transit line. I maybe some sitting furniture to watch the boats & socialise etc like this link, need good walk through space maintained though. https://goo.gl/images/RmjXT9 perhaps some with tables and shelter from summer sun or winter rain, I guess don’t want it too comfortable for people to camp out & live in though or obstruct view.